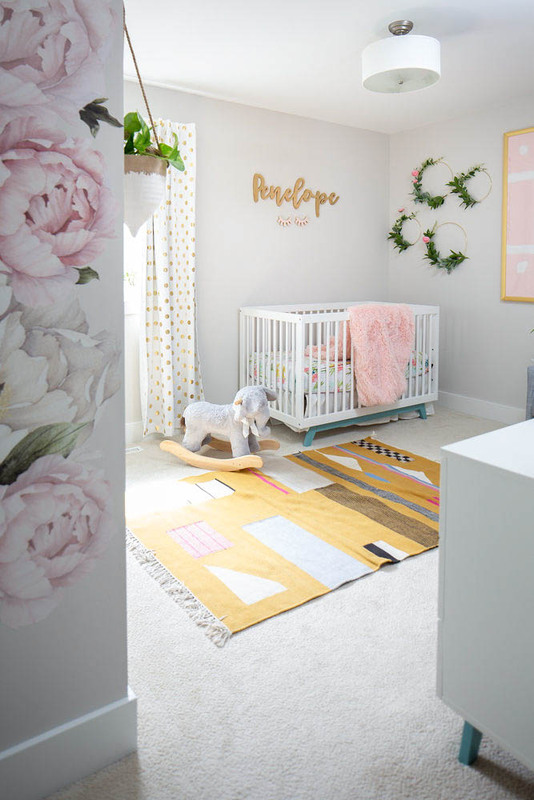 I am so excited to share today’s post with you because it’s something I’ve been working on for weeks and weeks. Ok, here’s the deal. We all get in style ruts, don’t we? It’s so easy to get bored with all of your clothes and feel like you have “nothing to wear”, right? Trust me, I get it! To help us all out, I wanted to create outfit inspiration ideas for fall. Do I think you need to own every single thing in the list? Definitely no! If you absolutely hate vests, don’t get one! If button down shirts make you cringe, by all means, take a pass on that. I will say, however, that trying new things is good for everyone! I haven’t worn a white button down shirt since college (you don’t need to know how long ago that was) when I was a server at Red Lobster. But, I’ve been seeing them pop up recently and Gap was running a sale, so I snagged one. Turns out, I love it!! If you’re nervous to try something new, try borrowing one from a friend or picking up a very inexpensive one from a thrift store or on clearance at Target. If you love it, you can invest in a better quality one and if you hate it, you’re not out too much! I broke everything up in 3 categories – the foundation, the layering piece and of course, the accessories! All of the outfits I created include a foundational piece + a layering piece + accessories. The hope is that you can start looking in your closet and notice these pieces as they’re intended. You could event take it so far to organize your closet into these categories (like I do!). That way you can pick out pieces from each category instead of shuffling through ALL of your clothes. Also, all of the items I’ve listed below are suggestions. You by no means need to go and buy exactly the item I’ve shared. For each product I’ve shared what you want to look for. For example, I have camouflage pants listed below. Maybe you hate all things camo. That’s ok! You do not need to buy camouflage pants. Switch these out with any sort of printed pant that you like! Or maybe printed pants just freak you out in general and you don’t even want to borrow a pair from a friend to wear around you house for an hour. That’s ok! Just skip that one. Maybe a few months down the road you’ll decide you want to try it and you can reference back to the outfit ideas and try out an outfit or two. I have notes by everything I own. I tend to buy less Target price items and do my best to shop places like Nordstrom or Anthropologie during sale times. Most of the items shown in the photo are average price items (aka not $10 t-shirts and not $100 t-shirts). I did my best to find you good options! Lastly, this should NOT stress you out. This should be fun!! 🙂 If you feel overwhelmed take a step back and come back to it later. 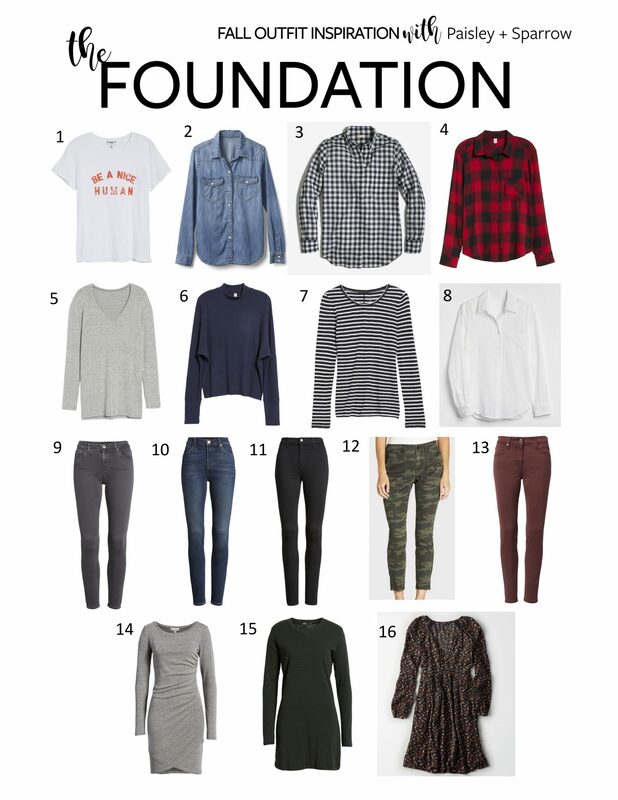 The Foundation pieces are your staples. Your first layer of clothes. You likely have the majority of these in your closet already. Just a note: some of the foundational pieces could also be used as layering pieces so you may see those doubled up in outfits. (For example, a sweater can be layered over a plaid shirt OR it can be worn under a vest). 1. Graphic Tee– Anything goes! It can be a saying, a picture or a design. Get what fits your style. 4. Colored Plaid or Patterned Shirt– This doesn’t necessarily need to be plaid but some sort of colored, patterned shirt. 5. Light Neutral Color Sweater – Grey, white, tan, etc…any sort of neutral colored sweater works! 6. Colored Sweater– Blue, green, maroon, etc…whatever color you’re most drawn to, get that! 7. Striped Long Sleeve Tee – Ideally I would go for black and white or navy and white if you’re only going to get one. I have both in my closet and wear them ALL the time. You could also choose a color you wear all the time. 9. Grey Denim – Grey denim has become my absolute favorite. They don’t fade like black often time do and are super chic. 10. Dark Blue Denim – These don’t need an explanation. 😉 Feel free to get distressed if that works with your lifestyle and you like those better! 12. Camouflage or any Pattern Pants– Camo may freak you out so feel free to get any kind of pattern that you love. 13. Colored Pants – Colored pants are an easy way to switch up an outfit. Go for a color you wear a lot that goes with other things in your wardrobe (like dark green, maroon, etc.). 14. Light, Neutral Color Dress – A light color dress is ideal for any situation (work/casual/date night) depending on how you pair it. 16. Stripe/Patterned Dress – A good quality patterned dress is a must for fall! Even if you’re afraid of patterned dress, you’ll find it easy to wear when you pair it with long cardigans to tone down the pattern a bit. These are the pieces that will elevate your outfit. Put on a pair of dark denim and a white button up shirt. Well, add a cardigan and pull the sleeves of the cardigan back just a bit so you can see a little bit of the white of your button down. Boom. Elevated. You look like you know what you’re doing because you not only but on pants and a top but you figured out how to layer another item with it! Don’t layer chunky over chunky. Do you have an amazing chunky cardigan? Pair it with a slimming top underneath or tuck in a loose top into your jeans. You don’t want to make yourself look heavier simply because you just have too many layers. Pair a cotton tee with a denim jacket. Mix a plaid shirt with a quilted vest. Same rule applies to your home! Outfits (and rooms) are more interesting when it’s not the same fabric from top to bottom. Don’t wear a polka dot shirt with the same polka dot pattern cardigan. Instead, pair that polka dot top with a striped cardigan. Ideally have one item have a small pattern and the other have a large one. Does this all make you nervous? Start with just one patterned item. 🙂 Pair a stripe shirt with a solid cardigan. Work your way up to mixing two different patterns! 1. Light Neutral Color Cardigan or Blazer– White, grey, off white, etc – any light color that you like. I have blazer or cardigan listed for the next 3 items. Some people prefer cardigans, some prefer blazer and some do both! I have a few blazers that I love wearing but I wear cardigans most often. 2. 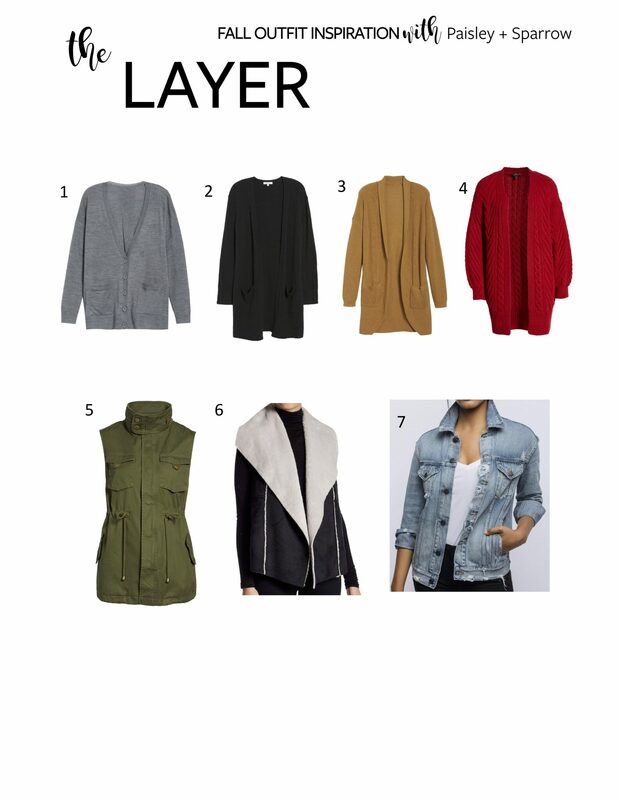 Dark Neutral Color Cardigan or Blazer – Black is ideal since it goes with everything but you could also do dark grey or something else dark depending on what you like! 3. Tan Cardigan or Blazer – Tan, brown, cognac – any brown that works with your wardrobe. 4. Colored Cardigan or Blazer– Whatever color you love! Red, purple, green, etc. the sky is the limit. 5. Army Vest – I have an army vest that I wear a ton. I’m a fan of the green but feel free to branch out to another color if you don’t like green. 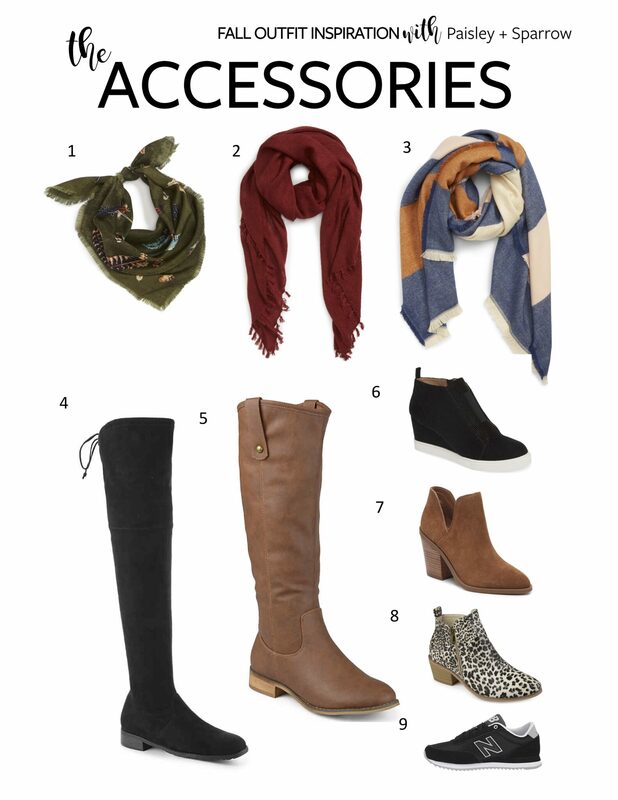 Last, but certainly not least, is your accessories. I should make note that I didn’t include any jewelry. I figured you could do whatever you’re most comfortable with when it comes to necklaces, earrings, bracelets, etc.. Shoes and scarves can be a bit more tricky so I wanted to highlight those. 1. Handkerchief Scarf – Or literally just a handkerchief! There are so many ways to wear these (watch for a post coming soon) – bandit style, rolled up and knotted, shawl style. A quick google search will give you some ideas. 2. Colored Scarf – Find one that coordinates with your favorite color schemes! Watch for weight of your scarf too – if it’s too heavy you’re neck and shoulders will be sore by the end of the day! 3. Printed Scarf – Same as above. 4. Tall Black Boots – Totally your preference on this one whether you want shin, knee or over the knee height. I’m a big fan of the OTK style currently so I typically do those! 5. Tall Brown Boots – Tan, Cognac, etc. – whatever you think goes with your wardrobe the best! 6. Black Booties – Flats, wedges, heeled – get whatever fits your lifestyle. 7. Brown Booties – Same as above! 8. Leopard Boots/Shoes – I bought a pair of leopard boots last year and wore them ALL the time. These are a must! 9. Sneakers (that you don’t wear for working out) – A cute comfy sneaker for running errands, going to the park, etc. These can be in any color! Like I mentioned, don’t feel like you need to run out and buy everything on this list. Start by shopping your closet! Maybe you don’t have a floral dress but you have a cute grey dress – use that for the patterned dress! Or maybe you have a brown blazer but not a brown cardigan. That works too! My best advice is to start with what you have and supplement with things you think you’ll get a ton of use out. Ok, and if you want the full list of 32 different outfit options, click here!!! You’ll just need to sign up for my weekly happy mail and you’ll be able to download it immediately! 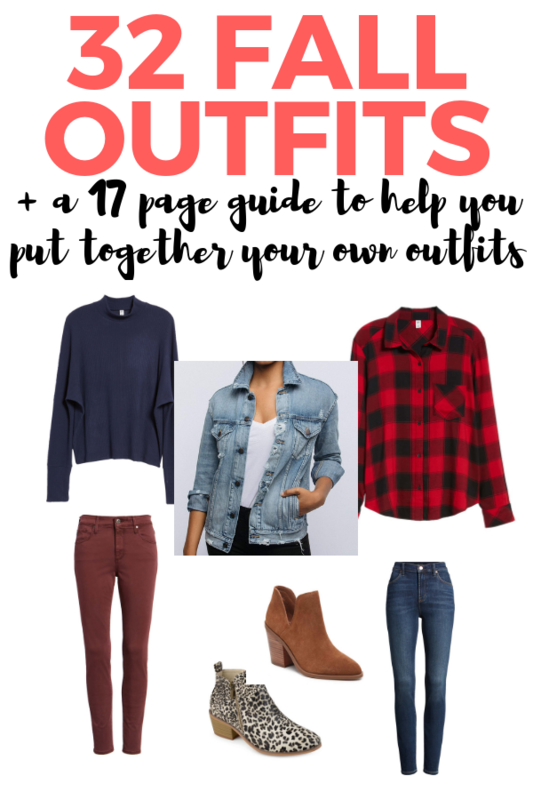 This is truly meant to help you learn to shop your closet and put outfits together that you’ll love and feel confident it. And remember, November 4th is the Paisley + Sparrow Outfit Party week (#PSoutfitparty)!! I hope you’ll join along by tagging me and using the hashtag in your outfits inspired by this guide! Mom Shirts on Etsy – the Best 9! I have such a tough time with layering – I think it’s a sensory issue thing related to autism – but I can’t stand layering long sleeved items together. I feel it makes the sleeves underneath (like a button down worn with a cardigan, for example) bunch up in the most uncomfortable way and it’ll drive me bonkers until I switch to something else. I totally understand! You don’t have to do long sleeve items – you could always do a short sleeve shirt with a cardigan! That works great. One tip if you do 2 long sleeve pieces together is to pull the arms of the base layer out past the top layer. That will prevent it from bunching up and making you feel uncomfortable. At the end of the day, do what works best for you! Pair tank tops with cardigans or vests with long sleeves. You can modify this to work for you!